When I left for my trip to Philadelphia, the trees in Minnesota weren’t budded yet. They were only fringed with new growth, delicate and feather-like, too fragile to even hold color. When I returned, the change of spring had arrived. 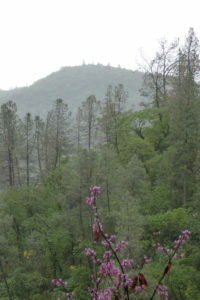 It feels like a metaphor for the ACIM/ACOL event, “Love and Miracles in Philadelphia,” and for what the trip revealed: a change in the landscape, the blossoming of new growth. Any time we have a “first” we are talking about change. There were two obvious and public “firsts” at the Center for Contermporary Mysticism where “Love and Miracles in Philadelphia” took place. One was that Jon Mundy and I were presenting together to nearly a hundred women and men eager to hear of ACIM and ACOL in a spirit of unity. 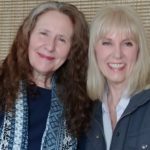 The other was that my long-time creative partner and spirit sister Mary Love joined me, and shared for the first time, how the transforming power of A Course of Love affected her life. While in many ways we’ve shared ACOL from day one, in others, equally true, we’re now experiencing it in a “new” way. The experience of the audience made up another hundred “firsts,” and there were side-bar firsts of meeting each other, of sharing one, or a half-dozen heartfelt connections, or having an encounter, perhaps, with one of the two ACOL publishers who were in attendance—Glenn Hovemann who oversees ACOL’s publishing worldwide, and Sebastian Blaksley who is bringing ACOL to the Spanish speaking world. There was a sharing of inspiration, of ideas, of stories. 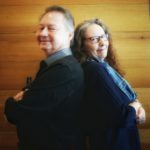 Jon and I began a full day together on Saturday, speaking of our mystical experiences and, for the rest of the day, spoke mainly on the complementarity of ACIM and ACOL, answering audience questions to close out the day. On Sunday Mary joined us and we were each guided by our hearts to the sharing that we did. What expanded through this sharing was union and relationship. 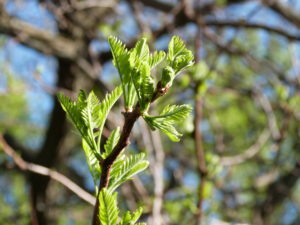 There were openings upon openings, like to the budding of the trees and flowers going on as we met. There was more at work than any of us know. Back at home afterwards, I faced fully the new situation with the backyard cabin that is home to my writer’s soul. 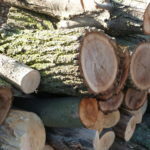 Now I had the time to sit looking out at the logs that are all that remain of my maple tree, the nearest, and dearest, and most profusely photographed of my tree friends. 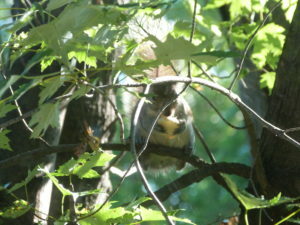 The maple was a magnificent, towering shelter where the squirrels I feed would sit looking in the cabin window as if sharing a meal with me; the tree whose limbs embraced the cabin and hid us from view. It was the tree that was dying and threatening the cabin, and that, in the first thaw of winter, before the new snows came, was taken down. I’d looked out the window from the house during the unending refusal of winter’s yield to spring, and see the cabin standing out there all alone, looking so exposed and bare without the maple’s presence. I felt as if nothing would ever be the same and I’d be exposed too, not sheltered as I like to be in that “out of the world” way that the cabin and the maple had always provided. Yet now the change of spring is filling in the blank spaces. The trees that remain are receiving more light, and they’re standing in all their glory, full and lush. When things change, new life begins. Something has begun. The field in which we meet has widened and there’s a thaw, a new spring, a new warmth, and blooming going on. 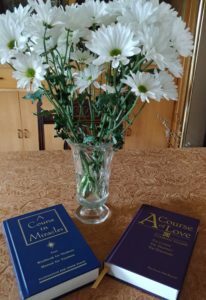 Here are links to the Love and Miracles Saturday videos, to the video of the Sunday event published to the site of our host: The Center for Contemporary Mysticism, and to Miracles Magazine. Sunday afternoon: Jon Mundy, Mari Perron, and Mary Love with an additional question and answer period. A beautiful reckoning of the hearts desire that ultimately leads to change. Thank you for the comfort of knowing this ultimate beauty of who and what we are. This New identity is powerful and reading , savoring the magical moment is priceless. Change leads one to love at the highest calling of the heart. Let the water flow from this fountain as we craddle the springwater. It leads to refreshment the New the joining of ACIM and ACOL is a beautiful recognition that the impossible is therefore truly possible. Love you and sorry I missed you.